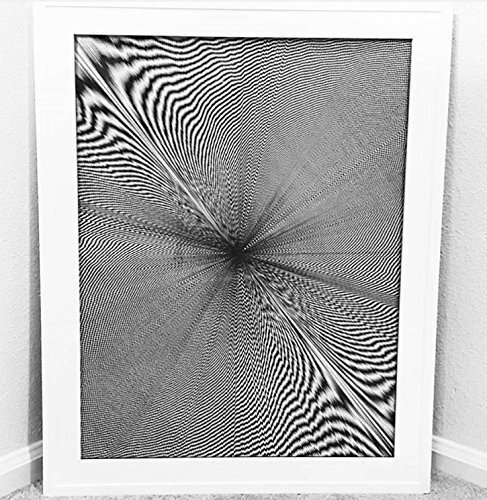 Moire Pattern, Hand Drawn, Framed, 82 Hours 58 Minutes by Jenna Weaver Ink at Eny Theme. Hurry! Limited time offer. Offer valid only while supplies last. This listing is for a hand drawn, framed work of art. This Moire pattern was drawn using Faber Castell Pitt Artist Pens on smooth white Paris Paper. This listing is for a hand drawn, framed work of art. This Moire pattern was drawn using Faber Castell Pitt Artist Pens on smooth white Paris Paper. The piece took 82 hours and 58 minutes to complete from start to finish. The paper is 18 x 24 inches and the total size of the finished piece in the frame is 21.5 x 27.5 inches. You will receive a framed piece of hand drawn art upon purchase. Color: Black ink on white paper. White frame, custom framed by Hobby Lobby. If you have any questions about this product by Jenna Weaver Ink, contact us by completing and submitting the form below. If you are looking for a specif part number, please include it with your message. Illustration J. Rainis book "The riddle"
Portrait Graphite Pencil of Person Quality Realism 11"x14"